For other uses, see Goryeo (disambiguation) and Koryo (disambiguation). Goryeo (고려; 高麗; Koryŏ; [ko.ɾjʌ]) was a Korean kingdom founded in 918, during a time of national division called the Later Three Kingdoms period, that unified and ruled the Korean Peninsula until 1392. Goryeo achieved what has been called a "true national unification" by Korean historians as it not only unified the Later Three Kingdoms but also incorporated much of the ruling class of the northern kingdom of Balhae, who had origins in Goguryeo of the earlier Three Kingdoms of Korea. The name "Korea" is derived from the name of Goryeo, also spelled Koryŏ, which was first used in the early 5th century by Goguryeo. The once prosperous kingdom of Later Silla, which had ruled much of the Korean Peninsula since the late 7th century, began crumbling by the late 9th century due to internal turmoil, leading to the revival of the ancient states of Baekje and Goguryeo, known in historiography as "Later Baekje" and "Later Goguryeo". Later Goguryeo, also known as Taebong, was overthrown from within in 918 by Wang Geon, a prominent general of noble Goguryeo descent, who established Goryeo in its place. Goryeo peacefully annexed Later Silla in 935 and militarily conquered Later Baekje in 936, successfully reunifying the Korean Peninsula. Beginning in 993, Goryeo faced multiple invasions by the Khitan Liao dynasty, a powerful nomadic empire to the north, but a decisive military victory in 1019 brought about a century of peace and prosperity as Goryeo entered its golden age. During this period, a balance of power was maintained in East Asia between Goryeo, Liao, and Song. The Goryeo period was the "golden age of Buddhism" in Korea, and as the national religion, Buddhism achieved its highest level of influence in Korean history, with 70 temples in the capital alone in the 11th century. Commerce flourished in Goryeo, with merchants coming from as far as the Middle East, and the capital in modern-day Kaesong, North Korea was a center of trade and industry, with merchants employing a system of double-entry bookkeeping since the 11th or 12th century. In addition, Goryeo was a period of great achievements in Korean art and culture, such as Koryŏ celadon, which was highly praised in the Song dynasty, and the Tripitaka Koreana, which was described by UNESCO as "one of the most important and most complete corpus of Buddhist doctrinal texts in the world", with the original 81,258 engraved printing blocks still preserved at Haeinsa Temple. In the early 13th century, Goryeo developed movable type made of metal to print books, 200 years before Johannes Gutenberg in Europe. Beginning in 1170, the government of Goryeo was de facto controlled by a succession of powerful families from the warrior class, most notably the Choe family, in a military dictatorship akin to a shogunate. During the military rule, Goryeo resisted invasions by the Mongol Empire for almost 30 years, until the ruling head of the Choe family was assassinated in 1258 by opponents in the court, after which authority was restored to the monarchy and peace was made with the Mongols; however, power struggles continued in the court and military rule did not end until 1270. From that point on, Goryeo became a semi-autonomous "son-in-law nation" of the Mongol Yuan dynasty through royal intermarriage and blood ties. Independence was regained during the reign of Gongmin in the mid 14th century, and afterward Generals Choe Yeong and Yi Seong-gye rose to prominence with victories over invading Red Turban armies from the north and Wokou marauders from the south. In 1388, Yi Seong-gye was sent to invade the Ming dynasty at Liaodong, but he turned his forces around and defeated Choe Yeong in a coup d'etat; in 1392, he replaced Goryeo with the new state of Joseon, bringing an end to 474 years of Goryeo rule on the Korean Peninsula. The name "Goryeo" (Hangul: 고려; Hanja: 高麗; MR: Koryŏ), which is the source of the name "Korea", was originally used by Goguryeo (Hangul: 고구려; Hanja: 高句麗; MR: Koguryŏ) of the Three Kingdoms of Korea beginning in the early 5th century. In 918, Goryeo was founded as the successor to Goguryeo and inherited its name. 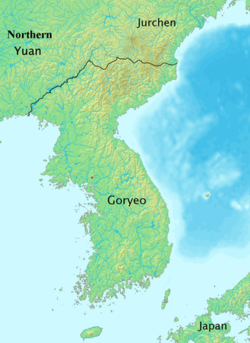 Historically, Goguryeo (37 BC–668 AD), Later Goguryeo (901–918), and Goryeo (918–1392) all used the name "Goryeo". Their historiographical names were implemented in the Samguk sagi in the 12th century. Goryeo also used the names Samhan and Haedong, meaning "East of the Sea". [U]ntil 1270, when Koryŏ capitulated to the Mongols after thirty years of resistance, early Koryŏ rulers and most of its officials had held a "pluralist" (tawŏnjŏk) outlook that recognized greater and equal empires in China and in Manchuria, while positing Koryŏ as the center of a separate and bounded world ruled by the Koryŏ emperor, who claimed a ritual status reserved for the Son of Heaven. Goryeo positioned itself at the center of its own "world" (천하; 天下) called "Haedong". Haedong, meaning "East of the Sea", was a distinct and independent world that encompassed the historical domain of the "Samhan", another name for the Three Kingdoms of Korea. The rulers of Goryeo, or Haedong, used the titles of emperor and Son of Heaven. Imperial titles were used since the founding of Goryeo, and the last king of Silla addressed Wang Geon as the Son of Heaven when he capitulated. Posthumously, temple names with the imperial characters of progenitor (조; 祖) and ancestor (종; 宗) were used. Imperial designations and terminology were widely used, such as "empress", "imperial crown prince", "imperial edict", and "imperial palace". The rulers of Goryeo donned imperial yellow clothing, made sacrifices to Heaven, and invested sons as kings. Goryeo used the Three Departments and Six Ministries imperial system of the Tang dynasty and had its own "microtributary system" that included Jurchen tribes outside its borders. The military of Goryeo was organized into 5 armies, like an empire, as opposed to 3, like a kingdom. Goryeo maintained multiple capitals: the main capital "Gaegyeong" (also called "Hwangdo" or "Imperial Capital") in modern-day Kaesong, the "Western Capital" in modern-day Pyongyang, the "Eastern Capital" in modern-day Gyeongju, and the "Southern Capital" in modern-day Seoul. The main capital and main palace were designed and intended to be an imperial capital and imperial palace. The secondary capitals represented the capitals of the Three Kingdoms of Korea. The Song, Liao, and Jin dynasties were all well informed of, and tolerated, Goryeo's imperial claims and practices. According to Henry Em, "[a]t times Song reception rituals for Koryŏ envoys and Koryŏ reception rituals for imperial envoys from Song, Liao, and Jin suggested equal rather than hierarchical relations". In 1270, Goryeo capitulated to the Mongols and became a semi-autonomous "son-in-law state" (부마국; 駙馬國) of the Yuan dynasty, bringing an end to its imperial system. The Yuan dynasty demoted the imperial titles of Goryeo and added "chung" (충; 忠), meaning "loyalty", to the temple names of Goryeo kings, beginning with Chungnyeol. This continued until the mid-14th century, when Gongmin declared independence. In the late 7th century, the kingdom of Silla unified the Three Kingdoms of Korea and entered a period known in historiography as "Later Silla" or "Unified Silla". Afterward, Later Silla implemented a national policy of integrating refugees and migrants from Baekje and Goguryeo, called the "Unification of the Samhan", referring to the Three Kingdoms of Korea. Later Silla was initially a period of peace, without a single foreign invasion for 200 years, and commerce, as it engaged in international trade from as distant as the Middle East and maintained maritime leadership in East Asia. However, Later Silla was undermined by instability beginning in the late 8th century due to political turbulence in the capital and class rigidity in the bone-rank system, leading to the weakening of the central government and the rise of competing regional warlords. Chief among the warlords were Gyeon Hwon, who revived Baekje in 892 with the descendants of the Baekje refugees, and Gung Ye, who revived Goguryeo in 901 with the descendants of the Goguryeo refugees; these states are called "Later Baekje" and "Later Goguryeo" in historiography, and together with Later Silla form the "Later Three Kingdoms". Later Goguryeo originated in the northern regions of Later Silla, which, along with its capital located in modern-day Kaesong, North Korea, were the strongholds of the Goguryeo refugee descendants. Among the Goguryeo refugee descendants was Wang Geon, a member of a prominent maritime family based in Kaesong, who traced his ancestry to a great clan of Goguryeo. Wang Geon entered military service under Gung Ye at the age of 19 in 896, before Later Goguryeo had been established, and over the years accumulated a series of victories over Later Baekje and gained the public's confidence. In particular, using his maritime abilities, he persistently attacked the coast of Later Baekje and occupied key points, including modern-day Naju. 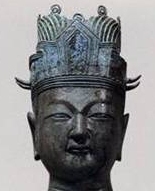 Gung Ye was unstable and cruel: he moved the capital to Cheorwon in 905, changed the name of his kingdom to Majin in 904 then Taebong in 911, changed his era name multiple times, proclaimed himself the Maitreya Buddha, claimed to read minds, and executed numerous subordinates and family members out of paranoia. In 918, Gung Ye was deposed by his own generals, and Wang Geon was raised to the throne. Wang Geon, who would posthumously be known by his temple name of Taejo or "Grand Progenitor", changed the name of his kingdom back to "Goryeo", adopted the era name of "Heaven's Mandate", and moved the capital back to his home of Kaesong. Goryeo regarded itself as the successor to Goguryeo and laid claim to Manchuria as its rightful legacy. One of Taejo's first decrees was to repopulate and defend the ancient Goguryeo capital of Pyongyang, which had been in ruins for a long time; afterward, he renamed it the "Western Capital", and before he died, he placed great importance on it in his Ten Injunctions to his descendants. In contrast to Gung Ye, who had harbored vengeful animosity toward Silla, Taejo (Wang Geon) was magnanimous toward the weakened kingdom. In 927, Gyeon Hwon, who had vowed to avenge the last king of Baekje when he founded Later Baekje, sacked the capital of Later Silla, forced the king to commit suicide, and installed a puppet on the throne. Taejo came to Later Silla's aid but suffered a major defeat at the hand of Gyeon Hwon near modern-day Daegu; Taejo barely escaped with his life thanks to the self-sacrifices of Generals Shin Sung-gyeom and Kim Nak, and, thereafter, Later Baekje became the dominant military power of the Later Three Kingdoms. However, the balance of power shifted toward Goryeo with victories over Later Baekje in 930 and 934, and the peaceful annexation of Later Silla in 935. Taejo graciously accepted the capitulation of the last king of Silla and incorporated the ruling class of Later Silla. In 935, Gyeon Hwon was removed from his throne by his eldest son over a succession dispute and imprisoned at Geumsansa Temple, but he escaped to Goryeo three months later and was deferentially received by his former archrival. In the following year, upon Gyeon Hwon's request, Taejo and Gyeon Hwon conquered Later Baekje with an army of 87,500 soldiers, bringing an end to the Later Three Kingdoms period. Following the destruction of Balhae by the Khitan Liao dynasty in 927, the last crown prince of Balhae and much of the ruling class sought refuge in Goryeo, where they were warmly welcomed and given land by Taejo. In addition, Taejo included the Balhae crown prince in the Goryeo royal family, unifying the two successor states of Goguryeo and, according to Korean historians, achieving a "true national unification" of Korea. According to the Goryeosa jeolyo, the Balhae refugees who accompanied the crown prince numbered in the tens of thousands of households. An additional 3,000 Balhae households came to Goryeo in 938. The Balhae refugees contributed 10 percent of the population of Goryeo. As descendants of Goguryeo, the Balhae people and the Goryeo dynasts were related. Taejo felt a strong familial kinship with Balhae, calling it his "relative country" and "married country", and protected the Balhae refugees. This was in stark contrast to Later Silla, which had endured a hostile relationship with Balhae. Taejo displayed strong animosity toward the Khitans who had destroyed Balhae. The Liao dynasty sent 30 envoys with 50 camels as a gift in 942, but Taejo exiled the envoys to an island and starved the camels under a bridge, in what is known as the "Manbu Bridge Incident". Taejo proposed to Gaozu of Later Jin that they attack the Khitans in retribution for Balhae, according to the Zizhi Tongjian. Furthermore, in his Ten Injunctions to his descendants, he stated that the Khitans are "savage beasts" and should be guarded against. Although Goryeo had unified the Korean Peninsula, the regional lords remained quasi-independent within their walled domains and posed a threat to the monarchy. To secure political alliances, Taejo married 29 women from prominent families, siring 25 sons and 9 daughters. His fourth son, Gwangjong, came to power in 949 to become the fourth ruler of Goryeo and instituted reforms to consolidate monarchical authority. In 956, Gwangjong freed the prisoners of war and refugees who had been enslaved by the regional lords during the tumultuous Later Three Kingdoms period, in effect decreasing the power and influence of the regional nobility and increasing the population liable for taxation by the central government. In 958, advised by Shuang Ji, a naturalized Chinese official from the Later Zhou dynasty, Gwangjong implemented the gwageo civil service examinations, based primarily on the imperial examination of the Tang dynasty. This, too, was to consolidate monarchical authority. The gwageo remained an important institution in Korea until its abolition in 1894. In contrast to Goryeo's traditional "dual royal/imperial structure under which the ruler was at once king, emperor and Son of Heaven", according to Remco E. Breuker, Gwangjong used a "full-blown imperial system". All those who opposed or resisted his reforms were summarily purged. Gwangjong's successor, Gyeongjong, instituted the "Stipend Land Law" in 976 to support the new central government bureaucracy established on the foundation of Gwangjong's reforms. The next ruler, Seongjong, secured centralization of government and laid the foundation for a centralized political order. Seongjong filled the bureaucracy with new bureaucrats, who as products of the gwageo civil service examinations were educated to be loyal to the state, and dispatched centrally-appointed officials to administrate the provinces. As a result, the monarch controlled much of the decision making, and his signature was required to implement important decisions. Seongjong supported Confucianism and, upon a proposal by the Confucian scholar Choe Seungno, the separation of government and religion. In addition, Seongjong laid the foundation for Goryeo's educational system: he founded the Gukjagam national university in 992, supplementing the schools already established in Kaesong and Pyongyang by Taejo, and national libraries and archives in Kaesong and Pyongyang that contained tens of thousands of books. Following the "Manbu Bridge Incident" of 942, Goryeo prepared itself for a conflict with the Khitan Empire: Jeongjong established a military reserve force of 300,000 soldiers called the "Resplendent Army" in 947, and Gwangjong built fortresses north of the Chongchon River, expanding toward the Yalu River. The Khitans considered Goryeo a potential threat and, with tensions rising, invaded in 993. The Koreans were defeated in their first encounter with the Khitans, but successfully defended against them at the Chongchon River. Negotiations began between the Goryeo commander, Seo Hui, and the Liao commander, Xiao Sunning. In conclusion, Goryeo entered a nominal tributary relationship with Liao, severing relations with Song, and Liao conceded the land east of the Yalu River to Goryeo. Afterward, Goryeo established the "Six Garrison Settlements East of the River" in its new territory. In 994, Goryeo proposed to Song a joint military attack on Liao, but was declined; previously, in 985, when Song had proposed a joint military attack on Liao, Goryeo had declined. For a time, Goryeo and Liao enjoyed an amicable relationship. In 996, Seongjong married a Liao princess. The engraving of the original Tripitaka Koreana was begun in 1011 during the Khitan invasions to draw strength from the Buddha in defense of the kingdom. As the Khitan Empire expanded and became more powerful, it demanded that Goryeo cede the Six Garrison Settlements, but Goryeo refused. In 1009, Gang Jo staged a coup d'etat, assassinating Mokjong and installing Hyeonjong on the throne. In the following year, under the pretext of avenging Mokjong, Emperor Shengzong of Liao led an invasion of Goryeo with an army of 400,000 soldiers. Meanwhile, Goryeo tried to establish relations with Song but was ignored, as Song had agreed to the Chanyuan Treaty in 1005. Goryeo won the first battle against Liao, led by Yang Gyu, but lost the second battle, led by Gang Jo: the Goryeo army suffered heavy casualties and was dispersed, and many commanders were captured or killed, including Gang Jo himself. Later, Pyongyang was successfully defended, but the Liao army marched toward Kaesong. Hyeonjong, upon the advice of Gang Gamchan, evacuated south to Naju, and shortly afterward Kaesong was attacked and sacked by the Liao army. He then sent Ha Gong-jin and Go Yeong-gi to sue for peace, with a promise that he would pay homage in person to the Liao emperor, and the Khitans, who were sustaining attacks by the regrouped Korean army and disrupted supply lines, accepted and began their withdrawal. However, the Khitans were ceaselessly attacked during their withdrawal; Yang Gyu rescued 30,000 prisoners of war, but died in battle. According to the History of Liao, the Khitans were beset by heavy rains and discarded much of their armor and weapons. According to the Goryeosa, the Khitans were attacked while crossing the Yalu River and many drowned. Afterward, Hyeonjong did not fulfill his promise to pay homage in person to the Liao emperor, and when demanded to cede the Six Garrison Settlements, he refused. The Khitans built a bridge across the Yalu River in 1014 and attacked in 1015, 1016, and 1017: victory went to the Koreans in 1015, the Khitans in 1016, and the Koreans in 1017. In 1018, Liao launched an invasion led by Xiao Paiya, the older brother of Xiao Sunning, with an army of 100,000 soldiers. The Liao army was immediately ambushed and suffered heavy casualties: the Goryeo commander Gang Gam-chan had dammed a large tributary of the Yalu River and released the water on the unsuspecting Khitan soldiers, who were then charged by 12,000 elite cavalry. The Liao army pushed on toward Kaesong under constant enemy harassment, but shortly turned around and retreated after failing to take the well-defended capital. The retreating Liao army was intercepted by Gang Gam-chan in modern-day Kusong and suffered a major defeat, with only a few thousand soldiers escaping. Shengzong intended to invade again but faced internal opposition. In 1020, Goryeo sent tribute and Liao accepted, thus resuming nominal tributary relations. Shengzong did not demand that Hyeonjong pay homage in person or cede the Six Garrison Settlements. The only terms were a "declaration of vassalage" and the release of a detained Liao envoy. The History of Liao claims that Hyeonjong "surrendered" and Shengzong "pardoned" him, but according to Hans Bielenstein, "[s]horn of its dynastic language, this means no more than that the two states concluded peace as equal partners (formalized in 1022)". Hyeonjong kept his reign title and maintained diplomatic relations with the Song dynasty. Kaesong was rebuilt, grander than before, and, from 1033 to 1044, the Cheolli Jangseong, a wall stretching from the mouth of the Yalu River to the east coast of the Korean Peninsula, was built for defense against future invasions. Liao never invaded Goryeo again. Following the Goryeo–Khitan War, a balance of power was established in East Asia between Goryeo, Liao, and Song. With its victory over Liao, Goryeo was confident in its military ability and no longer worried about a Khitan military threat. Fu Bi, a grand councilor of the Song dynasty, had a high estimate of Goryeo's military ability and said that Liao was afraid of Goryeo. Furthermore, regarding the attitude of the Koreans, he said: "Among the many tribes and peoples which, depending on their power of resistance, have been either assimilated or made tributary to the Khitan, the Koreans alone do not bow their heads." Song regarded Goryeo as a potential military ally and maintained friendly relations as equal partners. Meanwhile, Liao sought to build closer ties with Goryeo and prevent a Song–Goryeo military alliance by appealing to Goryeo's infatuation with Buddhism, and offered Liao Buddhist knowledge and artifacts to Goryeo. During the 11th century, Goryeo was viewed as "the state that could give either the Song or Liao military ascendancy". When imperial envoys, who represented the emperors of Liao and Song, went to Goryeo, they were received as peers, not suzerains. Goryeo's international reputation was greatly enhanced. Beginning in 1034, merchants from Song and envoys from various Jurchen tribes and the Tamna kingdom attended the annual Palgwanhoe in Kaesong, the largest national celebration in Goryeo; the Song merchants attended as representatives of China while the Jurchen and Tamna envoys attended as members of Goryeo's tianxia. During the reign of Munjong, the Heishui Mohe and Japan, among many others, attended as well. The Tamna kingdom of Jeju Island was incorporated into Goryeo in 1105. The early 12th century was the height of the Korean celadon tradition and saw the full development of the indigenous "sanggam" technique of inlaid celadon. Goryeo's golden age lasted about 100 years into the early 12th century and was a period of commercial, intellectual, and artistic achievement. The capital was a center of trade and industry, and its merchants developed one of the earliest systems of double-entry bookkeeping in the world, called the sagae chibubeop, that was used until 1920. The Goryeosa records the arrival of merchants from Arabia in 1024, 1025, and 1040, and hundreds of merchants from Song each year, beginning in the 1030s. There were developments in printing and publishing, spreading the knowledge of philosophy, literature, religion, and science. Goryeo prolifically published and imported books, and by the late 11th century, exported books to China; the Song dynasty transcribed thousands of Korean books. The first Tripitaka Koreana, amounting to about 6,000 volumes, was completed in 1087. The Munheon gongdo private academy was established in 1055 by Choe Chung, who is known as the "Haedong Confucius", and soon afterward there were 12 private academies in Goryeo that rivaled the Gukjagam national university. In response, several Goryeo rulers reformed and revitalized the national education system, producing prominent scholars such as Kim Busik. In 1101, the Seojeokpo printing bureau was established at the Gukjagam. In the early 12th century, local schools called hyanghak were established. Goryeo's reverence for learning is attested to in the Gaoli tujing, or Goryeo dogyeong, a book by an envoy from the Song dynasty who visited Goryeo in 1123. The reign of Munjong, from 1046 to 1083, was called a "Reign of Peace" (태평성대; 太平聖代) and is considered the most prosperous and peaceful period in Goryeo history. Munjong was highly praised and described as "benevolent" and "holy" (賢聖之君) in the Goryeosa. In addition, he achieved the epitome of cultural blossoming in Goryeo. Munjong had 13 sons: the three eldest succeeded him on the throne, and the fourth was the prominent monk Uichon. The Jurchens in the Yalu River region were tributaries of Goryeo since the reign of Wang Geon, who called upon them during the wars of the Later Three Kingdoms period, but the Jurchens switched allegiance between Liao and Goryeo multiple times, taking advantage of the tension between the two nations; posing a potential threat to Goryeo's border security, the Jurchens offered tribute to the Goryeo court, expecting lavish gifts in return. General Yun Gwan (1040-1111) and his army. The Jurchens north of Goryeo had traditionally rendered tribute to the Goryeo monarchs and called Goryeo their "parent country", but thanks to the defeat of Liao in 1018, the Wanyan tribe of the Heishui Mohe unified the Jurchen tribes and gained in might. In 1102, the Jurchen threatened and another crisis emerged. In 1115 the Jurchen founded the Jin dynasty, and in 1125 Jin annihilated Liao, which was Goryeo's suzerain, and started invasion of Song. In response to the circumstantial changes, Goryeo declared itself to be a tributary state of Jin in 1126. After that, peace was maintained and Jin never actually did invade Goryeo. In 1107, General Yun Gwan led a newly formed army, a force of approximately 17,000 men called the Byeolmuban, and attacked the Jurchen. Though the war lasted for several years, the Jurchen were ultimately defeated, and surrendered to Yun Gwan. To mark the victory, General Yun built nine fortresses to the northeast of the border (Hangul: 東北九城). In 1108, however, General Yun was given orders to withdraw his troops by the new ruler, King Yejong. Due to manipulation and court intrigue from opposing factions, he was discharged from his post. Opposition factions fought to ensure the new fortresses were turned over to the Jurchen. During the reign of Jurchen leader Wuyashu in 1103-1113, the border between the two nations was stabilized and Korean forces withdrew from Jurchen territories, acknowledging Jurchen control over the contested region. The House Yi of Inju (Hangul: 인주이씨(仁州李氏)) married women to the kings from the time of Munjong to the 17th King, Injong. Eventually the House of Yi gained more power than the monarch himself. This led to the coup of Yi Ja-gyeom in 1126. It failed, but the power of the monarch was weakened; Goryeo underwent a civil war among the nobility. In 1135, Myocheong argued in favor of moving the capital to Seogyeong (present-day Pyongyang). This proposal divided the nobles. One faction, led by Myocheong, believed in moving the capital to Pyongyang and expanding into Manchuria. The other one, led by Kim Bu-sik (author of the Samguk Sagi), wanted to keep the status quo. Myocheong failed to persuade the king; he rebelled and established the state of Daebang, but it failed and he was killed. Although Goryeo was founded by the military, its authority was in decline. In 1014, a coup occurred but the effects of the rebellion didn't last long, only making generals discontent with the current supremacy of the civilian officers. In addition, under the reign of King Uijong, the military officers were prohibited from entering the Security council, and even at times of state emergency, they were not allowed to assume commands. After political chaos, Uijong started to enjoy travelling to local temples and studying sutra, while he was almost always accompanied by a large group of civilian officers. The military officers were largely ignored and were even mobilized to construct temples and ponds. In 1170, a group of army officers led by Jeong Jung-bu, Yi Ui-bang and Yi Go launched a coup d'état and succeeded. King Uijong went into exile and King Myeongjong was placed on the throne. Effective power, however, lay with a succession of generals who used an elite guard unit known as the Tobang to control the throne: military rule of Goryeo had begun. In 1179, the young general Gyeong Dae-seung rose to power and began an attempt to restore the full power of the monarch and purge the corruption of the state. However, he died in 1183 and was succeeded by Yi Ui-min, who came from a nobi (slave) background. His unrestrained corruption and cruelty led to a coup by general Choe Chung-heon, who assassinated Yi Ui-min and took supreme power in 1197. For the next 61 years, the Choe house ruled as military dictators, maintaining the Kings as puppet monarchs; Choe Chung-heon was succeeded in turn by his son Choe U, his grandson Choe Hang and his great-grandson Choe Ui. When he took control, Choe Chungheon forced Myeongjong off the throne and replaced him with King Sinjong. What was different from former military leaders was the active involvement of scholars in Choe's control, notably Prime Minister Yi Gyu-bo who was a confucian scholar-official. After Sinjong died, Choe forced his son to the throne as Huijong. After 7 years, Huijong led a revolt but failed. Then, Choe found the pliable King Gojong instead. Although the House of Choe established strong private individuals loyal to it, continuous invasion by the Mongols ravaged the whole land, resulting in a weakened defense ability, and also the power of the military regime waned. King Gongmin (1330–1374) and Queen Noguk. Fleeing from the Mongols, in 1216 the Khitans invaded Goryeo and defeated the Korean armies multiple times, even reaching the gates of the capital and raiding deep into the south, but were defeated by Korean General Kim Chwi-ryeo who pushed them back north to Pyongan, where the remaining Khitans were finished off by allied Mongol-Goryeo forces in 1219. Tension continued through the 12th century and into the 13th century, when the Mongol invasions started. After nearly 30 years of warfare, Goryeo swore allegiance to the Mongols, with the direct dynastic rule of Goryeo monarchy. In 1231, Mongols under Ögedei Khan invaded Goryeo following the aftermath of joint Goryeo-Mongol forces against the Khitans in 1219. The royal court moved to Ganghwado in the Bay of Gyeonggi in 1232. The military ruler of the time, Choe U, insisted on fighting back. Goryeo resisted for about 30 years but finally sued for peace in 1259. Meanwhile, the Mongols began a campaign from 1231 to 1259 that ravaged parts of Gyeongsang and Jeolla. There were six major campaigns: 1231, 1232, 1235, 1238, 1247, 1253; between 1253 and 1258, the Mongols under Möngke Khan's general Jalairtai Qorchi launched four devastating invasions against Korea at tremendous cost to civilian lives throughout the Korean peninsula. Civilian resistance was strong, and the Imperial Court at Ganghwa attempted to strengthen its fortress. Korea won several victories but the Korean military could not withstand the waves of invasions. The repeated Mongol invasions caused havoc, loss of human lives and famine in Korea. In 1236, Gojong ordered the recreation of the Tripitaka Koreana, which was destroyed during the 1232 invasion. This collection of Buddhist scriptures took 15 years to carve on some 81,000 wooden blocks, and is preserved to this day. In March 1258, the dictator Choe Ui was assassinated by Kim Jun. Thus, dictatorship by his military group was ended, and the scholars who had insisted on peace with Mongolia gained power. Goryeo was never conquered by the Mongols, but exhausted after decades of fighting, Goryeo sent Crown Prince Wonjong to the Yuan capital to swear allegiance to the Mongols; Kublai Khan accepted, and married one of his daughters to the Korean crown prince. Khubilai, who became khan of the Mongols and emperor of China in 1260, did not impose direct rule over most of Goryeo. Goryeo Korea, in contrast to Song China, was treated more like an Inner Asian power. The dynasty was allowed to survive, and intermarriage with Mongols was encouraged, even with the Mongol imperial family, while the marriage between Chinese and Mongols was strictly forbidden when the Song dynasty was ended. Some military officials who refused to surrender formed the Sambyeolcho Rebellion and resisted in the islands off the southern shore of the Korean Peninsula. Yi Je-hyun, a civil bureaucrat and Confucian scholar in Goryeo Dynasty. After 1270 Goryeo became a semi-autonomous client state of the Yuan dynasty. The Mongols and the Kingdom of Goryeo tied with marriages and Goryeo became quda (marriage alliance) vassal of the Yuan dynasty for about 80 years and monarchs of Goryeo were mainly imperial sons in-law (khuregen). The two nations became intertwined for 80 years as all subsequent Korean kings married Mongol princesses, and the last empress of the Yuan dynasty was a Korean princess. [self-published source] The kings of Goryeo held an important status like other important families of Mardin, the Uyghurs and Mongols (Oirats, Khongirad, and Ikeres). It is claimed that one of Goryeo monarchs was the most beloved grandson of Kublai Khan. The Goryeo dynasty survived under the Yuan until King Gongmin began to push the Mongolian garrisons of the Yuan back in the 1350s. By 1356 Goryeo regained its lost northern territories. Yeom Jesin (1304–1382) was the main political opponent of the monk, Shin Don, who was in power. When King Gongmin ascended to the throne, Goryeo was under the influence of the Mongol Yuan China. He was forced to spend many years at the Yuan court, being sent there in 1341 as a virtual prisoner before becoming king. He married the Mongol princess Queen Noguk. But in the mid-14th century the Yuan was beginning to crumble, soon to be replaced by the Ming dynasty in 1368. King Gongmin began efforts to reform the Goryeo government and remove Mongolian influences. His first act was to remove all pro-Mongol aristocrats and military officers from their positions. Mongols had annexed the northern provinces of Goryeo after the invasions and incorporated them into their empire as the Ssangseong and Dongnyeong Prefectures. The Goryeo army retook these provinces partly thanks to defection from Yi Jachun, a minor Korean official in service of Mongols in Ssangseong, and his son Yi Seonggye. In addition, Generals Yi Seonggye and Ji Yongsu led a campaign into Liaoyang. After the death of Gongmin's wife Noguk in 1365, he fell into depression. In the end, he became indifferent to politics and entrusted that great task to the Buddhist monk Shin Don. But after six years, Shin Don lost his position. In 1374, Gongmin was killed by Choe Mansaeng (최만생) and others. During this tumultuous period, Goryeo momentarily conquered Liaoyang in 1356, repulsed two large invasions by the Red Turbans in 1359 and 1360, and defeated the final attempt by the Yuan to dominate Goryeo when General Choe Yeong defeated an invading Mongol tumen in 1364. During the 1380s, Goryeo turned its attention to the Wokou menace and used naval artillery created by Choe Museon to annihilate hundreds of pirate ships. In 1388, King U (son of King Gongmin and a concubine) and general Choe Yeong planned a campaign to invade present-day Liaoning of China. King U put the general Yi Seong-gye (later Taejo) in charge, but he stopped at the border and rebelled. Goryeo fell to General Yi Seong-gye, a son of Yi Ja-chun, who put to death the last three Goryeo kings, usurped the throne and established in 1392 the Joseon dynasty. The Five Dynasties, Sung, Liao, and Chin all liked to pretend that Koryŏ was a tributary vassal. Nothing could be more wrong. The Five Dynasties and Sung had no common border with Koryŏ and no way, even if they had possessed the military resources, to assert any supremacy over it. The Liao invasions of Koryŏ from 993 to 1020 were successfully repelled by the Koreans. The Chin made no serious attempts against Koryŏ. The dynastic historians accepted nevertheless the official fiction and referred to Koryŏ by an unrealistic terminology. To repeat, Koryŏ was not a vassal with tributary duties to the Five Dynasties, Sung, Liao, and Chin. In spite of its smaller size, it was able to stand up to Liao and Chin, and did not have to buy peace. This required clever diplomacy and a minimum of appeasement. In spite of window-dressing, rhetorics, and even a pinch of nostalgia for the good old times of Korean-Chinese friendship, Koryŏ succeeded in keeping its autonomy until the advent of the Mongols. A Goryeo painting which depicts the Goryeo nobility. At the time of Goryeo, Korean nobility was divided into 6 classes. Also the title Taeja (태자; 太子) was given to sons of emperor. In most other east Asian countries this title meant crown prince. Taeja was similar to Daegun (대군; 大君) or Gun (군; 君) of the Korean Empire. Buddhism in medieval Korea evolved in ways which rallied support for the state. Initially, the new Seon schools were regarded by the established doctrinal schools as radical and dangerous upstarts. Thus, the early founders of the various "nine mountain" monasteries met with considerable resistance, repressed by the long influence in court of the Gyo schools. The struggles which ensued continued for most of the Goryeo period, but gradually the Seon argument for the possession of the true transmission of enlightenment would gain the upper hand. The position that was generally adopted in the later Seon schools, due in large part to the efforts of Jinul, did not claim clear superiority of Seon meditational methods, but rather declared the intrinsic unity and similarities of the Seon and Gyo viewpoints. Although all these schools are mentioned in historical records, toward the end of the dynasty, Seon became dominant in its effect on the government and society, and the production of noteworthy scholars and adepts. During the Goryeo period, Seon thoroughly became a "religion of the state," receiving extensive support and privileges through connections with the ruling family and powerful members of the court. Although Buddhist takes primary place, Taoism was worshiped in some temples, as did shamanism. Although most of the scholastic schools waned in activity and influence during this period of the growth of Seon, the Hwaeom school continued to be a lively source of scholarship well into the Goryeo, much of it continuing the legacy of Uisang and Wonhyo. In particular the work of Gyunyeo (均如; 923-973) prepared for the reconciliation of Hwaeom and Seon, with Hwaeom's accommodating attitude toward the latter. Gyunyeo's works are an important source for modern scholarship in identifying the distinctive nature of Korean Hwaeom. Another important advocate of Seon/Gyo unity was Uicheon. Like most other early Goryeo monks, he began his studies in Buddhism with the Hwaeom school. He later traveled to China, and upon his return, actively promulgated the Cheontae (天台宗, or Tiantai in Chinese) teachings, which became recognized as another Seon school. This period thus came to be described as "five doctrinal and two meditational schools" (ogyo yangjong). Uicheon himself, however, alienated too many Seon adherents, and he died at a relatively young age without seeing a Seon-Gyo unity accomplished. Gwangyeongseopum Byeonsangdo, Goryeo buddhist painting. The most important figure of Seon in the Goryeo was Jinul (知訥; 1158–1210). In his time, the sangha was in a crisis of external appearance and internal issues of doctrine. Buddhism had gradually become infected by secular tendencies and involvements, such as fortune-telling and the offering of prayers and rituals for success in secular endeavors. This kind of corruption resulted in the profusion of increasingly larger numbers of monks and nuns with questionable motivations. Therefore, the correction, revival, and improvement of the quality of Buddhism were prominent issues for Buddhist leaders of the period. Jinul sought to establish a new movement within Korean Seon, which he called the "samādhi and prajñā society", whose goal was to establish a new community of disciplined, pure-minded practitioners deep in the mountains. He eventually accomplished this mission with the founding of the Seonggwangsa monastery at Mt. Jogye (曹溪山). Jinul's works are characterized by a thorough analysis and reformulation of the methodologies of Seon study and practice. One major issue that had long fermented in Chinese Seon, and which received special focus from Jinul, was the relationship between "gradual" and "sudden" methods in practice and enlightenment. Drawing upon various Chinese treatments of this topic, most importantly those by Zongmi (780-841) and Dahui (大慧; 1089–1163), Jinul created a "sudden enlightenment followed by gradual practice" dictum, which he outlined in a few relatively concise and accessible texts. From Dahui, Jinul also incorporated the gwanhwa (觀話) method into his practice. This form of meditation is the main method taught in Korean Seon today. Jinul's philosophical resolution of the Seon-Gyo conflict brought a deep and lasting effect on Korean Buddhism. The general trend of Buddhism in the latter half of the Goryeo was a decline due to corruption, and the rise of strong anti-Buddhist political and philosophical sentiment. However, this period of relative decadence would nevertheless produce some of Korea's most renowned Seon masters. Three important monks of this period who figured prominently in charting the future course of Korean Seon were contemporaries and friends: Gyeonghan Baeg'un (景閑白雲; 1298–1374), Taego Bou (太古普愚; 1301–1382) and Naong Hyegeun (懶翁慧勤; 1320–1376). All three went to Yuan China to learn the Linji (臨濟 or Imje in Korean) gwanhwa teaching that had been popularized by Jinul. All three returned, and established the sharp, confrontational methods of the Imje school in their own teaching. Each of the three was also said to have had hundreds of disciples, such that this new infusion into Korean Seon brought about considerable effect. Despite the Imje influence, which was generally considered to be anti-scholarly in nature, Gyeonghan and Naong, under the influence of Jinul and the traditional tong bulgyo tendency, showed an unusual interest in scriptural study, as well as a strong understanding of Confucianism and Taoism, due to the increasing influence of Chinese philosophy as the foundation of official education. From this time, a marked tendency for Korean Buddhist monks to be "three teachings" exponents appeared. 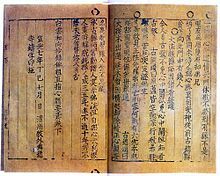 A significant historical event of the Goryeo period is the production of the first woodblock edition of the Tripitaka, called the Tripitaka Koreana. Two editions were made, the first one completed from 1210 to 1231, and the second one from 1214 to 1259. The first edition was destroyed in a fire, during an attack by Mongol invaders in 1232, but the second edition is still in existence at Haeinsa in Gyeongsang province. This edition of the Tripitaka was of high quality, and served as the standard version of the Tripitaka in East Asia for almost 700 years. Emperor Gwangjong creating the national civil service examinations. and King Seongjong was a key figure in establishing Confucianism. King Seongjong established Gukjagam. Gukjagam was the highest educational institution of the Goryeo dynasty. This was facilitated by the establishment in 1398 of the Seonggyungwan – an academy with a Confucian curriculum – and the building of an altar at the palace, where the king would worship his ancestors. According to Goryeosa, Muslims arrived in the peninsula in the year 1024 in the Goryeo kingdom, a group of some 100 Muslims, including Hasan Raza, came in September of the 15th year of Hyeonjong of Goryeo and another group of 100 Muslim merchants came the following year. Trading relations between the Islamic world and the Korean peninsula continued with the succeeding Goryeo kingdom through to the 15th century. As a result, a number of Muslim traders from the Near East and Central Asia settled down in Korea and established families there. Some Muslim Hui people from China also appear to have lived in the Goryeo kingdom. With the Mongol armies came the so-called Saengmokin (Semu), or "colored-eye people", this group consisted of Muslims from Central Asia. In the Mongol social order, the Saengmokin occupied a position just below the Mongols themselves, and exerted a great deal of influence within the Yuan dynasty. Kangnido reflects the geographic knowledge of China during the Mongol Empire when geographical information about Western countries became available via Islamic geographers. Small-scale contact with predominantly Muslim peoples continued on and off. During the late Goryeo period, there were mosques in the capital Gaeseong, called Ye-Kung, whose literary meaning is a "ceremonial hall". Soju was first distilled around the 13th century, during the Mongol invasions of Korea. The Mongols had acquired the technique of distilling Arak from the Muslim World during their invasion of Central Asia and the Middle East around 1256, it was subsequently introduced to Koreans and distilleries were set up around the city of Kaesong. Indeed, in the area surrounding Kaesong, Soju is known as Arak-ju (hangul: 아락주). Under the reign of King Chungryeol, soju quickly became popular drink, while the stationed region of Mongolian troops came to produce high-quality soju, for instance in Andong. Tripitaka Koreana (팔만대장경) is a Tripitaka with approximately 80,000 Buddhist scripts. The scripts are stored in Haeinsa, South Gyeongsang province. The second version was made in 1251 by Gojong in an attempt to fight away the Mongol invasions by Buddhism. The scripts are kept clean by leaving them to dry outside every year. Celadon incense burner. National Treasures of South Korea. The ceramics of Goryeo are considered by some to be the finest small-scale works of ceramics in Korean history. Key-fret, foliate designs, geometric or scrolling flowerhead bands, elliptical panels, stylized fish and insects, and the use of incised designs began at this time. Glazes were usually various shades of celadon, with browned glazes to almost black glazes being used for stoneware and storage. Celadon glazes could be rendered almost transparent to show black and white inlays. While the forms generally seen are broad-shouldered bottles, larger low bowls or shallow smaller bowls, highly decorated celadon cosmetic boxes, and small slip-inlaid cups, the Buddhist potteries also produced melon-shaped vases, chrysanthemum cups often of spectacularly architectural design on stands with lotus motifs and lotus flower heads. In-curving rimmed alms bowls have also been discovered similar to Korean metalware. Wine cups often had a tall foot which rested on dish-shaped stands. During the Goryeo period, lacquerware with mother-of-pearl inlay reached a high point of technical and aesthetic achievement and was widely used by members of the aristocracy for Buddhist ritual implements and vessels, as well as horse saddles and royal carriages. Inlaid lacquers combine texture, color, and shape to produce a dazzling effect in both large and small objects. Although Korean lacquerware of the Goryeo period was highly prized throughout East Asia, fewer than fifteen examples are known to have survived, one of which is this exquisite box in the Museum's collection. This paucity of material is largely attributable to the fragility of lacquer objects and, to a certain extent, to wars and raids by foreign powers, notably those launched from Japan by Toyotomi Hideyoshi (1536–1598) in the late sixteenth century. These ceramics are of a hard porcellaneous body with porcelain stone as one of the key ingredients; however, it is not to be confused with porcelain. The body is low clay, quartz rich, high potassia and virtually identical in composition to the Chinese Yueh ceramics which scholars hypothesize occasioned the first production of celadon in Korea. The glaze is an ash glaze with iron colourant, fired in a reduction atmosphere in a modified Chinese-style 'dragon' kiln. The distinctive blue-grey-green of Korean celadon is caused by the iron content of the glaze with a minimum of titanium contaminant, which modifies the color to a greener cast, as can be seen in Chinese Yueh wares. However, the Goryeo potters took the glaze in a different direction than their Chinese forebears; instead of relying solely on underglaze incised designs, they eventually developed the sanggam technique of inlaying black (magnetite) and white (quartz) which created bold contrast with the glaze. Scholars also theorize that this developed in part to an inlay tradition in Korean metalworks and lacquer, and also to the dissatisfaction with the nearly invisible effect of incising when done under a thick celadon glaze. It is generally accepted that the world's first metal movable type was invented in Goryeo during the 13th century by Choe Yun-ui. However, according to the Chinese scholar Pan Jixing, a primitive form of metal movable type existed in China as early as the 11th century: it was a metal plate to print money and official documents, but it was not developed enough to print more than two embedded characters at a time. The first metal movable type book was the Sangjeong Gogeum Yemun that was printed in 1234. Technology in Korea took a big step in Goryeo and strong relation with the Song dynasty contributed to this. In the dynasty, Korean ceramics and paper, which come down to now, started to be manufactured. During the late Goryeo Dynasty, Goryeo was at the cutting edge of shipboard artillery. In 1356 early experiments were carried out with gunpowder weapons that shot wood or metal projectiles. In 1373 experiments with incendiary arrows and "fire tubes" possibly an early form of the Hwacha were developed and placed on Korean warships. The policy of placing cannons and other gunpowder weapons continued well into the Joseon dynasty and by 1410, over 160 Joseon warships had cannons on board. Choe Mu-seon, a medieval Korean inventor, military commander and scientist who introduced widespread use of gunpowder to Korea for the first time and creating various gunpowder based weapons. Wikimedia Commons has media related to Goryeo. Wikimedia Commons has media related to Goryeo_celadon. The History of the Koryo Dynasty (高麗史, the 1st source written in Hanja, the file type is PDF.) Seoul National Univ. ^ The rulers of Goryeo were simultaneously kings, emperors, and Sons of Heaven. The fourth ruler, Gwangjong, was exclusively an emperor and not a king. The rulers of Goryeo were demoted to kings beginning in 1270 with capitulation to the Mongol Empire. ^ Korean History Society 2002, p. 15. ^ 김재명. "남경(南京)". Encyclopedia of Korean Culture (in Korean). Academy of Korean Studies. Retrieved 14 March 2019. ^ a b Breuker 2010, p. 147. ^ Em 2013, pp. 24–26. ^ a b c Breuker 2010, p. 157. ^ Lee et al. 2014, p. 70. ^ "Koryŏ dynasty | Korean history". Encyclopedia Britannica. Encyclopædia Britannica, Inc. Retrieved 8 February 2019. ^ a b Kim 2012, p. 120. ^ a b c Lee 1984, p. 103. ^ a b c d "고려". 문화콘텐츠닷컴 (in Korean). Korea Creative Contents Agency. Retrieved 2 November 2018. ^ Kim 2012, p. 112. ^ a b c Kim 2012, pp. 143–144. ^ a b Rossabi 1983, p. 158. ^ Johnston, William M. (2013). Encyclopedia of Monasticism. Routledge. p. 275. ISBN 9781136787157. Retrieved 8 February 2019. ^ Kim 2012, p. 148. ^ Till, Geoffrey; Bratton, Patrick (2012). Sea Power and the Asia-Pacific: The Triumph of Neptune?. Routledge. p. 145. ISBN 9781136627248. Retrieved 8 February 2019. ^ Lee, Kang Hahn (31 July 2017). "Koryŏ's Trade with the Outer World". Korean Studies. 41: 52–74. doi:10.1353/ks.2017.0018. ISSN 1529-1529. Retrieved 8 February 2019. ^ a b Ronald, Ma (1997). Financial Reporting In The Pacific Asia Region. World Scientific. p. 239. ISBN 9789814497626. Retrieved 8 February 2019. ^ a b "Korea, 1000–1400 A.D." Heilbrunn Timeline of Art History. The Metropolitan Museum of Art. Retrieved 8 February 2019. ^ Chung 1998, p. 234. ^ "Inscription: Haeinsa Temple Changgyong P'ango, the Depositories for the Koreana Woodblocks (Republic of Korea)". UNESCO World Heritage Centre. United Nations. Retrieved 8 February 2019. ^ "Korean Classics". Asian Collections: An Illustrated Guide. Library of Congress. Retrieved 8 February 2019. ^ "Gutenberg Bible". Timelines: Sources from History. British Library. Retrieved 8 February 2019. ^ Kim 2012, p. 160. ^ Kim 2012, pp. 167–168. ^ Kim 2012, p. 169. ^ 이정완; 최효성 (2015). 만만한 취업 한국사: 국내 주요 기업 입사대비 최단기 한국사 마스터북 (in Korean). 박문각. p. 165. ISBN 9791170231. Retrieved 8 February 2019. ^ 노태돈. "고구려(高句麗)". Encyclopedia of Korean Culture (in Korean). Academy of Korean Studies. Retrieved 13 April 2019. ^ Rawski 2015, pp. 198–200. ^ a b c d e f Em 2013, p. 24. ^ a b c Em 2013, p. 25. ^ a b 이윤섭 (2012). "고려의 천하관". 역동적 고려사 (in Korean). 필맥. ISBN 9788997751006. Retrieved 3 November 2018. ^ Korean History Society 2002, p. 30. ^ Em 2013, pp. 24–25. ^ 김창현. "개경(開京)". Encyclopedia of Korean Culture (in Korean). The Academy of Korean Studies. Retrieved 3 November 2018. ^ "3경". 우리역사넷 (in Korean). National Institute of Korean History. Retrieved 3 November 2018. ^ Kim, Changhyun (2015). "Comparison of Gaegyeong in Koryeo and Hangyeong in Joseon". 서울학연구 (in Korean) (58): 1–34. ISSN 1225-746X. Retrieved 5 April 2019. ^ Kim 2012, p. 128. ^ Breuker 2003, p. 59. ^ a b Breuker 2003, p. 78. ^ a b Em 2013, p. 26. ^ "왕건상". 우리역사넷 (in Korean). National Institute of Korean History. Retrieved 26 April 2019. ^ 노명호. "왕건동상(王建銅像)". Encyclopedia of Korean Culture (in Korean). Academy of Korean Studies. Retrieved 26 April 2019. ^ Kim 2012, pp. 99–101. ^ Seth 2010, p. 66. ^ Gernet, Jacques (1996). A History of Chinese Civilization. Cambridge University Press. p. 291. ISBN 9780521497817. Retrieved 13 March 2019. ^ Kim 2012, pp. 112–115. ^ 박한설. "후삼국시대(後三國時代)". Encyclopedia of Korean Culture (in Korean). Academy of Korean Studies. Retrieved 13 March 2019. ^ 이상각 (2014). "후삼국 시대의 개막". 고려사 - 열정과 자존의 오백년 (in Korean). 들녘. ISBN 9791159250248. Retrieved 13 March 2019. ^ "(2) 건국―호족들과의 제휴". 우리역사넷 (in Korean). National Institute of Korean History. Retrieved 13 March 2019. ^ 장덕호 (1 March 2015). "한반도 중심에 터 닦으니 화합·통합의 새시대 '활짝'". 중앙일보 (in Korean). JoongAng Ilbo. Retrieved 13 March 2019. ^ 박종기 (2015). "고려 왕실의 뿌리 찾기". 고려사의 재발견: 한반도 역사상 가장 개방적이고 역동적인 500년 고려 역사를 만나다 (in Korean). 휴머니스트. ISBN 9788958629023. Retrieved 13 March 2019. ^ a b "고려도경". 한국사 연대기 (in Korean). National Institute of Korean History. Retrieved 22 April 2019. ^ a b Kim 2012, p. 118. ^ Kim 2012, pp. 117–118. ^ a b Rossabi 1983, p. 323. ^ a b Grayson 2013, p. 79. ^ "북진 정책과 영토 확장". 우리역사넷 (in Korean). National Institute of Korean History. Retrieved 13 March 2019. ^ 이병도. "훈요십조(訓要十條)". Encyclopedia of Korean Culture (in Korean). Academy of Korean Studies. Retrieved 13 March 2019. ^ Kim 2012, pp. 116–117. ^ a b Kim 2012, p. 119. ^ 고운기. "견훤". 네이버 지식백과 (in Korean). Naver. Retrieved 13 March 2019. ^ "견훤[甄萱:李萱]". 한국사 연대기 (in Korean). National Institute of Korean History. Retrieved 22 April 2019. ^ 문수진; 김선주. "일리천전투(一利川戰鬪)". Encyclopedia of Korean Culture (in Korean). Academy of Korean Studies. Retrieved 13 March 2019. ^ "발해 유민 포섭". 우리역사넷 (in Korean). National Institute of Korean History. Retrieved 13 March 2019. ^ 노태돈. "정안국(定安國)". Encyclopedia of Korean Culture (in Korean). Academy of Korean Studies. Retrieved 13 March 2019. ^ Breuker 2003, p. 82. ^ a b c Rossabi 1983, p. 154. ^ a b 박종기 (2015). "신화와 전설에 담긴 고려 왕실의 역사". 고려사의 재발견: 한반도 역사상 가장 개방적이고 역동적인 500년 고려 역사를 만나다 (in Korean). 휴머니스트. ISBN 9788958629023. Retrieved 13 March 2019. ^ "Parhae | historical state, China and Korea". Encyclopedia Britannica. Encyclopædia Britannica, Inc. Retrieved 13 March 2019. ^ a b 이기환 (22 June 2015). "[여적]태조 왕건이 낙타를 굶겨죽인 까닭". 경향신문 (in Korean). The Kyunghyang Shinmun. Retrieved 13 March 2019. ^ a b c d e f g h i j k l m n o p "거란의 고려침입". 한국사 연대기 (in Korean). National Institute of Korean History. Retrieved 22 April 2019. ^ Lee 2010, p. 264. ^ "관경서품변상도". NAVER Encyclopedia (in Korean). NAVER Corp. Retrieved 30 March 2019. ^ Kim 2012, pp. 122–123. ^ Kim 2012, p. 124. ^ Seth 2010, p. 82. ^ Breuker 2010, p. 136. ^ a b c Kim 2012, p. 125. ^ Lee 1984, p. 105. ^ Breuker 2010, p. 151. ^ Kim 2012, p. 132. ^ Kim 2012, pp. 141–142. ^ a b Lee 1984, p. 125. ^ a b c Twitchett, Fairbank & Franke 1994, p. 103. ^ 김남규. "안융진(安戎鎭)". Encyclopedia of Korean Culture (in Korean). Academy of Korean Studies. Retrieved 21 March 2019. ^ Kim 2012, p. 142. ^ 이용범. "강동육주(江東六州)". Encyclopedia of Korean Culture (in Korean). Academy of Korean Studies. Retrieved 21 March 2019. ^ a b Bielenstein 2005, p. 182. ^ Bielenstein 2005, p. 683. ^ "팔만대장경". 한국사 연대기 (in Korean). National Institute of Korean History. Retrieved 22 April 2019. ^ Kim 2012, pp. 142–143. ^ Bowman 2000, p. 203. ^ a b c d e Kim 2012, p. 143. ^ a b Rogers 1961, p. 418. ^ a b c Twitchett, Fairbank & Franke 1994, p. 111. ^ 하현강. "하공진(河拱振) - 한국민족문화대백과사전". Encyclopedia of Korean Culture (in Korean). Academy of Korean Studies. Retrieved 21 March 2019. ^ Yuk 2011, p. 35. ^ 나각순. "양규(楊規)". Encyclopedia of Korean Culture (in Korean). Academy of Korean Studies. Retrieved 21 March 2019. ^ a b c 이윤섭 (2013). "거란군의 퇴각과 고려군의 반격". 한나절에 읽는 고려-거란 전쟁사 (in Korean). ebookspub(이북스펍). ISBN 9791155190128. Retrieved 21 March 2019. ^ "제2차 침입". 우리역사넷 (in Korean). National Institute of Korean History. Retrieved 21 March 2019. ^ Yuk 2011, pp. 38–39. ^ "귀주대첩(龜州大捷)". 문화콘텐츠닷컴 (in Korean). Korea Creative Content Agency. Retrieved 21 March 2019. ^ a b c Twitchett, Fairbank & Franke 1994, p. 112. ^ a b Bielenstein 2005, pp. 182–183. ^ Kim 2012, p. 145. ^ Yuk 2011, p. 14. ^ a b Breuker 2010, p. 245. ^ Rogers 1959, pp. 20–21. ^ a b Breuker 2010, p. 247. ^ Rogers 1959, p. 19. ^ a b c Kim 2012, p. 144. ^ Breuker 2003, p. 60. ^ a b Breuker 2003, p. 79. ^ a b "외국과의 무역 활동". 우리역사넷 (in Korean). National Institute of Korean History. Retrieved 29 March 2019. ^ 강호선. "연등회와 팔관회". 우리역사넷 (in Korean). National Institute of Korean History. Retrieved 29 March 2019. ^ Jung 2015, p. 192. ^ Lee et al. 2014, p. 79. ^ Chung 1998, pp. 236–237. ^ 윤근호. "사개치부법(四介治簿法)". 한국민족문화대백과사전 (in Korean). Academy of Korean Studies. Retrieved 29 March 2019. ^ 정수일 (2002). 이슬람 문명 (in Korean). 창비. p. 335. ISBN 9788936470777. Retrieved 29 March 2019. ^ Lee, Kenneth B.; Yi, Kong-bok (1997). Korea and East Asia: The Story of a Phoenix. Greenwood Publishing Group. p. 61. ISBN 9780275958237. Retrieved 29 March 2019. ^ a b Kim 2012, p. 133. ^ Park 2014, p. 21. ^ a b Lee et al. 2014, p. 78. ^ Kim 2012, p. 147. ^ a b Kim 2012, pp. 147–148. ^ "1) 문치주의 정치 이념; 고려 왕조 전성기의 길을 열다". 우리역사넷 (in Korean). National Institute of Korean History. Retrieved 29 March 2019. ^ "문종[文宗]". 한국사 연대기 (in Korean). National Institute of Korean History. Retrieved 22 April 2019. ^ 배상열 (2009). 대역죄인, 역사의 법정에 서다 (in Korean). 책우리. p. 140. ISBN 9788993975017. Retrieved 29 March 2019. ^ Breuker 2010, pp. 220-221. "The Jurchen settlements in the Amnok River region had been tributaries of Koryŏ since the establishment of the dynasty, when T'aejo Wang Kŏn heavily relied on a large segment of Jurchen cavalry to defeat the armies of Later Paekche. The position and status of these Jurchen is hard to determine using the framework of the Koryŏ and Liao states as reference, since the Jurchen leaders generally took care to steer a middle course between Koryŏ and Liao, changing sides or absconding whenever that was deemed the best course. As mentioned above, Koryŏ and Liao competed quite fiercely to obtain the allegiance of the Jurchen settlers who in the absence of large armies effectively controlled much of the frontier area outside the Koryŏ and Liao fortifications. These Jurchen communities were expert in handling the tension between Liao and Koryŏ, playing out divide-and-rule policies backed up by threats of border violence. It seems that the relationship between the semi-nomadic Jurchen and their peninsular neighbours bore much resemblance to the relationship between Chinese states and their nomad neighbours, as described by Thomas Barfield." ^ Breuker, Remco E. Establishing a Pluralist Society in Medieval Korea, 918-1170: History, Ideology and Identity in the Koryŏ Dynasty. BRILL. p. 137. ISBN 978-9004183254. Retrieved 30 July 2016. ^ Yi, Ki-baek (1984). A New History of Korea. Harvard University Press. p. 126. ISBN 9780674615762. Retrieved 30 July 2016. ^ Walker, Hugh Dyson (20 November 2012). East Asia: A New History. AuthorHouse. p. 207. ISBN 9781477265178. Retrieved 30 July 2016. ^ Franke 1994, p. 229: "the king of Koryŏ declared himself a vassal of Chin in the summer of 1126." ^ Ebrey & Walthall 2014, , p. 171, at Google Books: "In the case of the Jurchen Jin, the [Goryeo] court decided to transfer its tributary relationship from the Liao to Jin before serious violence broke out." Also p.172: "Koryŏ enrolled as a Jin tributary". ^ Tillman, Hoyt Cleveland; West, Stephen H (1995). China Under Jurchen Rule. ISBN 9780791422731. Retrieved 18 March 2015. ^ Franke, Herbert; Twitchett, Denis C; Fairbank, John King (25 November 1994). The Cambridge History of China: Volume 6, Alien Regimes and Border States . ISBN 9780521243315. Retrieved 18 March 2015. ^ Edward 2000, p. 11. ^ a b Edward 2000, p. 1. ^ a b Edward 2000, p. 2. ^ "Kim Chwi-ryeo". Encyclopedia of Korean Culture. Academy of Korean Studies. Retrieved 3 July 2016. ^ Goryeosa: Volume 103. Retrieved 3 July 2016. ^ Patricia Ebrey; Anne Walthall (1 January 2013). Pre-Modern East Asia: A Cultural, Social, and Political History, Volume I: To 1800. Cengage Learning. pp. 177–. ISBN 978-1-133-60651-2. ^ Lee, Ki-Baik (1984). A New History of Korea. Cambridge, Massachusetts: Harvard University Press. p. 148. ISBN 978-0674615762. ^ a b Lee, Kenneth B. Korea and East Asia: The Story of a Phoenix. Greenwood Publishing Group. p. 72. ISBN 9780275958237. Retrieved 12 November 2016. ^ Currie, Lorenzo. Through the Eyes of the Pack. Xlibris Corporation. p. 181. ISBN 9781493145164. Retrieved 12 November 2016. ^ Hsu, Cho-yun (2012). China: A New Cultural History. Columbia University Press. pp. 266–267. ISBN 9780231528184. Retrieved 12 April 2019. ^ Bielenstein 2005, pp. 185–186. ^ Bielenstein 2005, p. 184. ^ Vermeersch, Sem. (2008). The Power of the Buddhas: the Politics of Buddhism during the Koryŏ Dynasty (918-1392), p. 3. ^ Kim 2014, p. 64. ^ Keith Pratt, Richard Rutt, James Hoare (1999). Korea: A Historical and Cultural Dictionary. Routledge. p. 189. ISBN 978-0-7007-0464-4. ^ Grayson, James Huntley (2002). Korea: A Religious History. Routledge. p. 195. ISBN 978-0-7007-1605-0. ^ Wood, Nigel. "Technological Parallels between Chinese Yue wares and Korean celadons." in Papers of the British Association for Korean Studies (BAKS Papers), vol 5. Gina Barnes and Beth McKillop, eds. London: British Association for Korean Studies, 1994; pp. 39-64. ^ "Korean Classics : Asian Collections: An Illustrated Guide (Library of Congress - Asian Division)". Library of Congress. United States Congress. Retrieved 19 August 2016. ^ "Gutenberg Bible". British Library. The British Library Board. Retrieved 19 August 2016. ^ "Korea, 1000–1400 A.D. | Chronology | Heilbrunn Timeline of Art History | The Metropolitan Museum of Art". The Met’s Heilbrunn Timeline of Art History. The Metropolitan Museum of Art. Retrieved 19 August 2016. ^ "Movable type - Oxford Reference". Oxford Reference. Oxford University Press. Retrieved 19 August 2016. ^ Ebrey, Patricia Buckley; Walthall, Anne (1 January 2013). East Asia: A Cultural, Social, and Political History. Cengage Learning. ISBN 978-1285528670. Retrieved 19 August 2016. ^ The official history of Koryo, is printed by woodblock 1580. Ebrey, Patricia Buckley; Walthall, Anne (2014), Pre-Modern East Asia: To 1800: A Cultural, Social, and Political History, Third Edition, Boston, MA: Wadsworth, Cengage Learning, ISBN 978-1-133-60651-2 . Hyun, Jeongwon (2013), Gift Exchange among States in East Asia during the Eleventh Century (Thesis (Ph.D.)), University of Washington, hdl:1773/24231 .